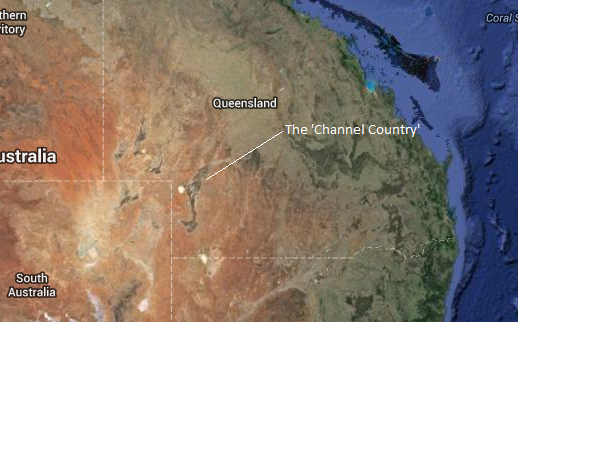 Here are a few photos from the flights I did in April 2007 'Channel Country', western Queensland. The Channel Country starts where the Thompson and Barcoo Rivers join to become Cooper Creek. Only in Australia would two rivers become a creek! The Barcoo River on the left and the Thompson on the right flow southward into Cooper Creek. But the 'creek' is 70km wide! A network of braided channels. The water spreads out and soaks in. and all 'organic', no chemical residues here. Can't even work the cattle in these conditions. Have to wait until it all dries out to muster them with helicopter. But nearby is parched and dry, since no rain fell here, all the water came from far away. It's a natural irrigation system. This dune desert is nearby. Also nearby is 'Lake' Yamma Yamma. That's varying hues of dry mud, no water at all. These two lakes are a puzzle. Both have water but one lush green and the other barren??? A cozy campsite for the night. This used to be a sheep station but now it's been taken over for a national park. The wildlife has already found a good use for the windmill. Australian bush flies are a real niusance. They have no manners at all, and are forever trying to crawl in your eyes and up your nose. Thus the Australian expression for when someone is annoying you, "...He's gettin' up my nose...". This is that full-rounded leading edge, that with VGs makes such a good STOL wing! A whirlwind, or dust devil, or willy willy. Some dust from a willy willy at 3000ft. Shows the power and persistence of a vortex! I once counted 11 such dust devils visible at one time. Very rough to fly when these are around - not all of them show dust. The small clay pan that I landed on near Cooper Creek. Those vehicle tracks show that is has been soft and muddy...... always a risk when landing on clay pans. But it's dry and hard now. A perfect landing ground. Camped for the night on the clay pan. I just love this life! This is the image that I keep as the 'home page' on my computer - very nostalgic. Old seismic lines looking for oil and gas. Digging for opals at Yowah. Another take-off run from a 'bush' landing. Plenty of room for this aircraft. Finally, the rich cultivated land of the Darling Downs. Dusty wheels back home, carrying memories of adventures! These small wheels are now replaced by much larger ones, for landing on rougher ground.